Welcom to our page on building a Virtual Flight Vraining for personal use. Flight Simulation has come long way in the last 20 years making the personal Virtual Flight Training Device (VFTD) a reality using commercially available flight simulator software coupled with easy to setup panels. Entry level VFTD configurations can be built to support skill development throughout your flying training or purely for entertainment. The Montreal Aeroplus experience provided below is to help you choose an entry level set of equipment available from mail order companies. updating it as your flying needs expand. no additional costs for assembling the equipment. The Primary Aircraft consist of the Yoke and Rudder Pedals Engine Controls. The commercially available yokes include Engine Controls. Also yokes provide controls for an aircrafts electric trim. During early flight training students spend a lot of time manually trimming the aircraft. Additional manual trim wheels are included in this segment. Products from CH, Logitech G Saitek and Thrustmaster are available that work with all the popular flight simulator software brands and rudder pedals. The CH products have an integrated Piper style Throttle,Prop and Mixture controls on the yoke and are available in two models: CH 200-615, CH 200-616. The 200-616 includes paddles for the rudder functions. Both products are connected via a simple to install USB connector. The Logitech G Saitek Products have a separate Yoke and Piper Throttle Quadrant assemblies. The Yoke and throttels connected via single USB connection includes an integrated USB hub that requires an additional power supply to connect additional panels. 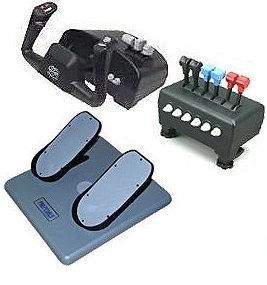 CH Products, Logitech G Saitek and Thrustmaster provide rudder pedals with USB connections. All are interchangeable with the yoke and engine controls in section 1.1.1 above. Trim wheels are currently difficult to purchase. The Avionics Multi Panel in section 1.3.2 includes a manual elevator trim control. Secondary controls provide the ability to control power, engine magnetos, aircraft lights, landing gear and flaps and also provide feedback on the landing gear position. Logitech G Saitek provide an entry level panel that enhances the experience practising on a VFTD and connects via a single USB connector. Avionics provide panels to control the simulated Radios, Auto pilot and Radio Navigation Instruments. Entry level panels are available from Logitech G Saitek and can be stacked or placed side by side. The Radio Panel allows the simulated aircraft Com1 and 2, Nav 1 and 2, ADF, DME and Transponder to be controlled and the selected frequencies or readouts displayed. The panel provides two displays that present the conformation from the radio selected by the rotary control and is connected via a single USB connector. Multiple panels can be used with the flight simulation application. The main benefit of multiple panels are faster access to the radio controls during IFR procedure practising. The Multi panel allows the auto pilot functions to be selected and is connected via single USB connectors. The multipanel includes a Manual Trim wheel and controls for an aircrafts auto throttle. 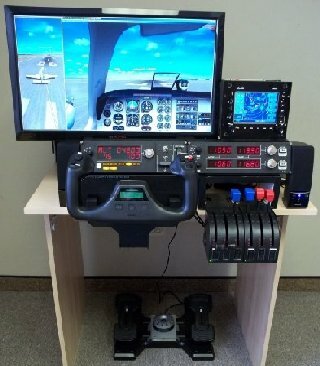 Typically Personal Virtual Flight Training Devices use the main computer monitor to display the simulated aircraft instruments. Using multiple monitors a separate screen can be dedicated to display the instrument panel and a second, or more, monitors can be added to display the out the window view from the cockpit for added realism. Other solutions are available to provide an additional display that shows a small set of cockpit instruments. This will allow the computer monitor to be used for only the out of the window view that is familiar to pilots. Logitech G Saitek Offer a single instrument display that plugs into a USB port on the computer. The single display will render multiple types of displays including Airspeed, Altitude, Horizon, Vertical Speed,Engine Speed, and a combination Display. Multiple displays can be connected to the flight simulation program. There are multiple flight simulation applications available on the market. For personal use X-Plane and Microsoft Flight Simulator X: Steam edition are available. For professional use Prepar3D and X-Plane are available in professional versions. For best results Gaming Computers are recommended with Graphics cards that can support Direct X 11. A minimum of a Quad Core Processor is recommended, with 8GB of memory, and a Minimum of a GTX 650 or similar graphics card. With Computers the limit is going to be your budget. Examples of gaming computers are shown below. It is also possible to build your own computer from the component parts. With many panels required for a Personal VFTD a USB hub is going to be necessary. A seven (7) input one is recommended. CH products and Logitech G Saitek offer add on engine controls when you need to control more than a single engine.